While visiting Mastodon Ridge, we invite you to enjoy your ice cream, coffee or lunch at one of our many picnic tables and benches located on the site. When visiting Mastodon Ridge, enjoy your favourite ice cream or frozen yogurt. We have a great selection! Be sure stop in for an awesome selection of Atlantic Canadian food and beverages. The store sells local produce, baked goods, seafood, meat, deli and grocery items. We have Atlantic Canadian tea, coffee, maple syrup, honey, candy and much more! We also sell quality T-shirts and handcrafted items. 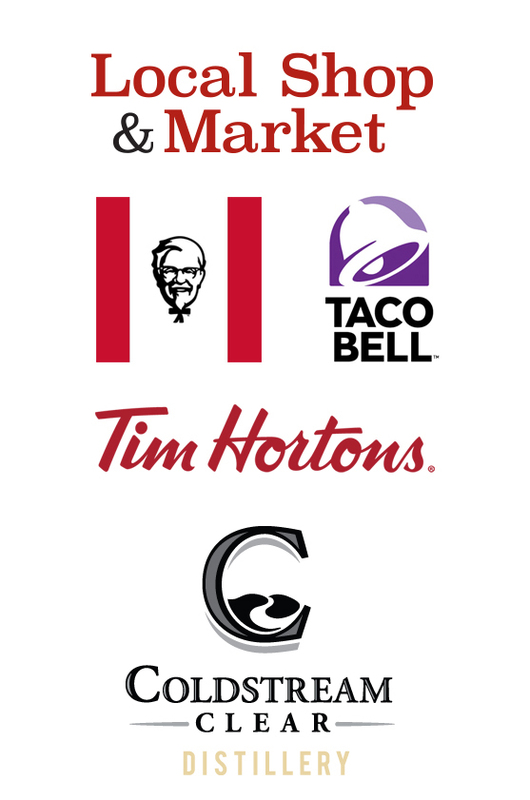 A fixture in Stewiacke and Mastodon Ridge for decades, the Stewiacke KFC/Taco Bell is the largest in Atlantic Canada! Anxious to taste the Colonel’s chicken or dive into your favourite taco? The folks at KFC/Taco Bell are ready to serve you! Located at Mastodon Ridge, the Stewiacke Tim Hortons is one of the largest in Atlantic Canada! With an extensive selection of fresh baked goods including donuts, muffins, and home-style sandwiches, they have something for everyone. Of course, no day is complete without a cup of Tim Hortons coffee. Locally owned and operated, Coldstream Clear Distillery is excited to share with you Nova Scotia’s best tasting spirits! Their premium products include Whiskey, Rum, Vodka and a variety of seasonal flavours. Stop by their Distillery store at Mastodon Ridge and discover their quality products for yourself. Learn more online at ColdstreamClear.com. Be sure to follow them on social media.